I heard about Sean’s results and how he was using HOW2s to help him get them. I went to see Sean. The transcript is below. Ian: What current job are you in? What Sector? Sean: I am teaching apprentices at the moment. I teach functional skills. What are the functional skills? English and Maths at Level 1 and 2 and in some cases there will be ICT at level 2 as well. 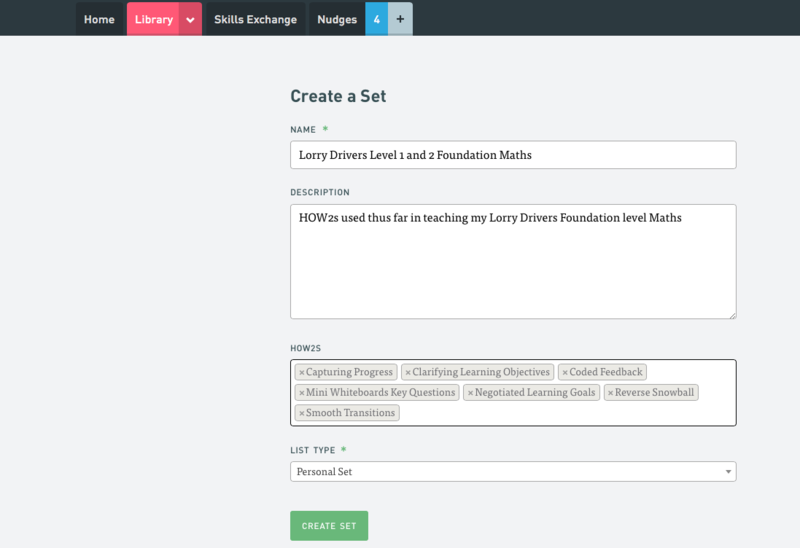 So, you are using the HOW2s to teach all those students? Yes, that is correct. I’ve also taught in FE and in prisons. Did you use HOW2s when you were in FE and working in prisons? Looking at your current job, what impact has using HOW2s had on helping you achieve your results? I think is has had a huge impact and to really understand that I wouldn’t mind talking about the types of students I teach at the moment. 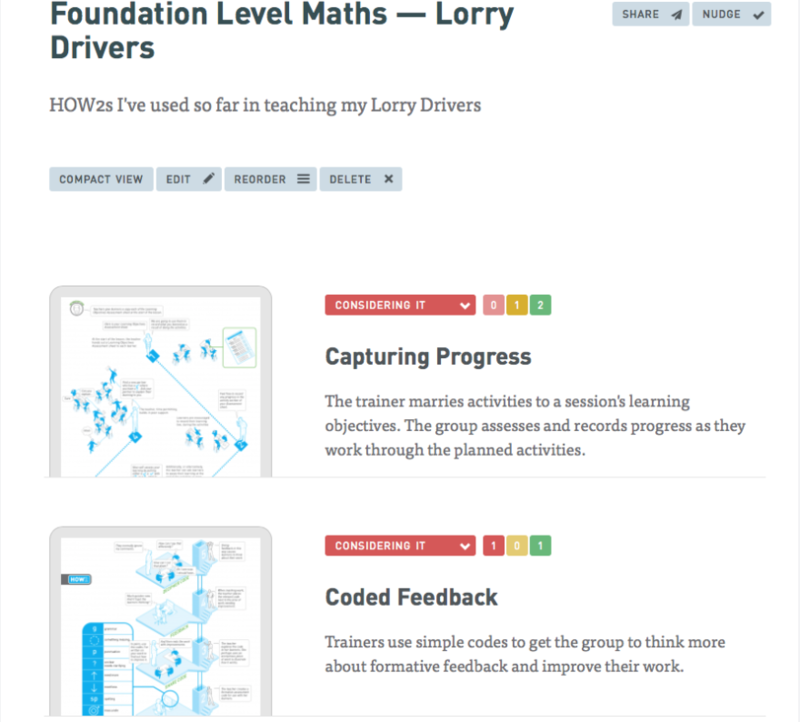 So, I’m teaching people to become lorry drivers, or predominantly that is what they are coming in to do – to drive LGVs. As part of their apprenticeship they are quite unhappy to discover that they’ve got English and Maths to complete up to Level 1 and also have to attempt Level 2. The ages can range from 18 and upwards and a lot of the students I have are students who say that they have had an horrendous time at school and just can’t get on with it. One of the HOW2s I get them to use is “Capturing Progress”. What I do is to get them to talk about how they feel in certain areas and how they can improve upon it. They tend to get quite a low score to begin with, but as soon as we’ve done about 10 minutes and they understand that area in say maths, if they originally put down a low score and now they’ve put down a high score, they’ve already bought into the lesson. I can turn round students as quickly as that with that one HOW2 and get them interested in the class. So HOW2s have actually been quite vital for my results. Trainers / Assessors find HOW2s to suit their situation. Brilliant. So, are you saying ‘buy in’ is essential in order to get results? What improvement do you see on the student’s engagement and motivation? You’ve covered it previously, but could you go into some more detail about that? Yes, of course. Well it’s the buy-in. The buy-in is a huge part because they are all quite surprised that they have to do the English and Maths. I normally get a quote like “I’m here to drive a lorry mate, not do English and Maths!”. And, of course, I have a talk with them to try to win them over to see the benefits of doing it. But using the HOW2s I can get the buy-in to it really quickly. Are you saying that using these techniques, it is very different from the experience that they’ve had at school? I’ve never been a school teacher, so I’d struggle to comment on that, but they say that they feel more included. So, with the “Capturing Progress” once again we adapt it and use “Negotiated Learning Goals” to work out what order our lessons are going to be in as well because it highlights all the main areas that we are going to cover. So, when they see quite high scores against all the main areas, they know that they’ve covered everything they need to pass the test. Could you give me some examples of other techniques that you’ve found useful? One of my favourite ways to end the session is something called “Reverse Snowball”. It is really creating an opportunity for the whole class to have discussions, which I find is absolutely fantastic and, as well as getting the main points from every single group and person onto one sheet, I’ve used it in such a way that I then go on to photocopy these sheets that the whole class have come up with and they use it for their coursework. So, that is “Capturing Progress”, “Negotiated Learning Goals” , “Reverse Snowball”; what others have you used? What techniques do you use the most? I use “Mini whiteboards” an awful lot. I use them to check for understanding , to make sure that everyone is involved and to recapping on previous sessions , to preview understanding of forthcoming content for really detailed things in functional skills — like checking spellings. I also use “Clarifying Objectives” and “Smooth Transitions” to make sure they know what to do and understand what to do and how to do it before moving to independent learning tasks. Did you find that you were imagining yourself as the teacher when you use the HOW2s to learn new techniques? Yes, I assume that is what everyone does. I tend to picture not only myself, but also my students. I tend to picture the students that I have had in the past that I found most challenging and then plan the activity as if they were in my session. If it works for these situations it will work for all of my students. How many times did you need to go back to learn a new technique before you felt confident teaching it in front of a class? To be honest with the infographics, I tend to pick the techniques up fairly quickly. I have on occasions gone back to clarify that I was doing it correctly, but the first time round I tend to pick up a lot of the information. So, did you feel fairly confident when you were looking at the visuals that you were able to commit it to memory? Yes, absolutely. The only one that I needed to spend more time on was “Coded Feedback” and that was because we were just making one up for a computer-based system. What about adapting the HOW2s? Did you ever look at a HOW2 and think yes, I could use that but I would need to change step 2 for example? Yes, I have adapted a few things, especially in terms of making up resources. Going back to “Capturing Progress” and “Reverse Snowball”, I’ve made up my own resources so I can use them in a way that suits my students , my context. So, when you are using the HOW2 techniques, how do you find your students? Are they, for example, relaxed, interested in what you are proposing to do? What was their experience of your new teaching technique? Interested, of course, but wary at the same time. They were a little bit unsure and didn’t see the point of it to be perfectly honest; particularly with “Capturing Progress”. But once you’ve explained to them what the purpose of this is, you get the buy-in very, very quickly. So, I feel that they do work well and pick it up as long as you take the time to explain what you hope to gain from each activity. Do you feel that students have learned more through these techniques than in your previous experience when you didn’t have the HOW2s? Once again, I feel that they definitely have learned more and from a teacher’s point of view, I feel it is easier to demonstrate that learning has taken place by using these HOW2s. Many thanks for your time Sean. For the HOW2 subscribers among you, here are the links to the HOW2s Sean referred to.